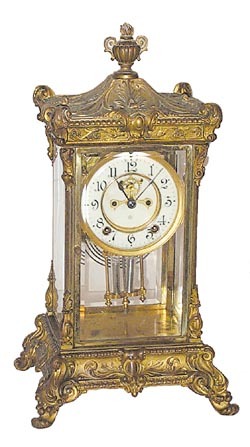 Ansonia Clock Co. crystal regulator, "Elysian", ca 1914. 16 1/2 inch case needs to be cleaned and polished. 1 side glass is cracked at one corner, 3 good beveled glasses. Case originally had a rich gold finish, now is dirty, tarnished, may clean up, but more than likely will need a need finish. Imitation mercury pendulum, 1 vial broken. 8 day, striking half hours on a cathedral gong, 2 piece porcelain dial, 1 hairline, open escapement. Some problems but the price was adjusted accordingly. Ly-Ansonia No.360.